Grab and hold onto the toughest materials with the industrial grapple attachment. Built for maximum power and reliability, the industrial grapple delivers easy handling of hard-to-manage materials in the industrial or construction setting. The two-arm design of larger industrial grapples provides strong, even biting force. 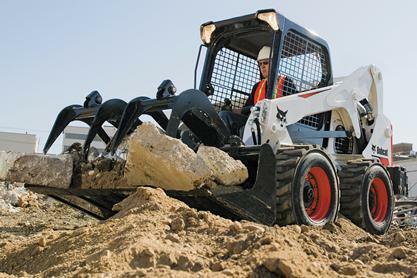 With hydraulic controls, it’s easy to operate and can securely handle bulky or uneven loads. Smaller grapples have a single grapple arm. Choose from a bucket or fork bottom for maximum load capability. Built for day-in, day-out duty, the industrial grapple sinks in to the toughest jobs all day, every day. From reinforced tines to larger cylinders and better hose routing, some industrial grapples are built better than others. Compare them side-by-side and learn how Bobcat offers better design and superior quality. Good sight lines are critical to sorting debris, securing odd-shaped objects, clamping tree limbs and more. In this simple comparison, you'll discover how Bobcat industrial grapples offer better views that lead to greater efficiency. Dual Cylinders (Large Grapples Only): With tough Bobcat®-built cylinders, dual cylinders provide the ability to secure uneven loads. Bobcat grapples provide the highest clamping forces in the industry. In the closing force challenge video, see why Bobcat industrial grapples offer the force to handle stubborn materials and work faster. Removable Hose Guide: Provides hose routing when the grapple is attached. Watch the design and quality video to see all of the Bobcat strengths.Better Hose Routing and Protection: Reduces exposure to snags and other hazards. Learn more about this advantage in the design and quality video.Replaceable Cutting Edge on Bucket Grapples: Standard equipment for bucket protection. Replaceable Tapered Fork on Fork Grapples: Allows for picking up larger materials and leaving valuable dirt behind. Provisions for adding additional forks to narrow the space between fork tines. Reinforced Tines: Backed by more steel and greater reinforcement. Watch the design and quality video to see the difference. Open Grapple Design: Provides superior visibility to the work area. Compare the design of other brands by watching the visibility challenge video. Greaseable Pivot Points: Provide long life for pins and bushings. Discover the maintenance headaches of other brands in the design and quality video. Inertia-Welded Cylinder Ends: As a Bobcat exclusive design, the inertia-welded cylinder ends deliver strong, smooth operation by improving hydraulic cushioning at the end of the stroke.